In Gurukulas (Indian or Vedic schools), what Indian children learned during their punishment is recognized as a great Yoga for improving brain and now termed as Super brain Yoga by scientists and the western world! 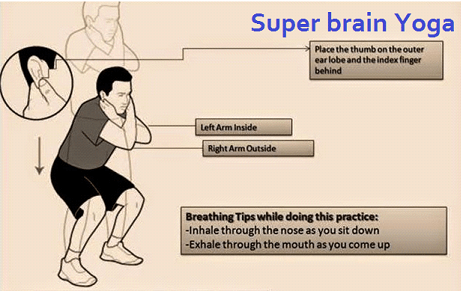 This easy 3-5 minute Yogic technique or exercise is called SuperBrain Yoga and it has been shown through research to improve the academic and behavioral performance of students, this was the reason in traditional Indian schools, Teachers or Gurus were giving such kind of punishments which involved Yogic techniques of Hath Yoga, which is now called Super Brain Yoga. Even while bowing down to deities in temples, Hindu people touch their earlobes in similar fashion. 1. Hold right earlobe with the index finger and thumb of left hand. Make sure that the thumb is facing away from you. 2. Hold left earlobe with the index finger and thumb of right hand. Once again, make sure that your thumb is facing away from you. 3. Continue to hold your lobes as you press your tongue to the roof of your mouth. 4. Inhale through your nose, and slowly lower yourself into a squatting position. 5. Hold your breath. Do not exhale until you start making your way back up to a standing position. Continue holding your lobes and sticking your tongue to the roof of your mouth.